Two friends of mine, my dentist Foad Farhoumand, DDS and his sister Farah Farhoumand, DDS, hired TNT Dental to design a new website for their Farhoumand Dental Practice and to rewrite the content for it. They asked me to assist them with implementing a coherent social media strategy and search engine optimization in order to address an interesting SEO challenge made apparent with the launch of their new website. With the recent Hummingbird update of the Google Search Engine algorithm, the challenges for any small business are very real. In the case of Farhoumand Dental, the new changes translate into actual business loss. 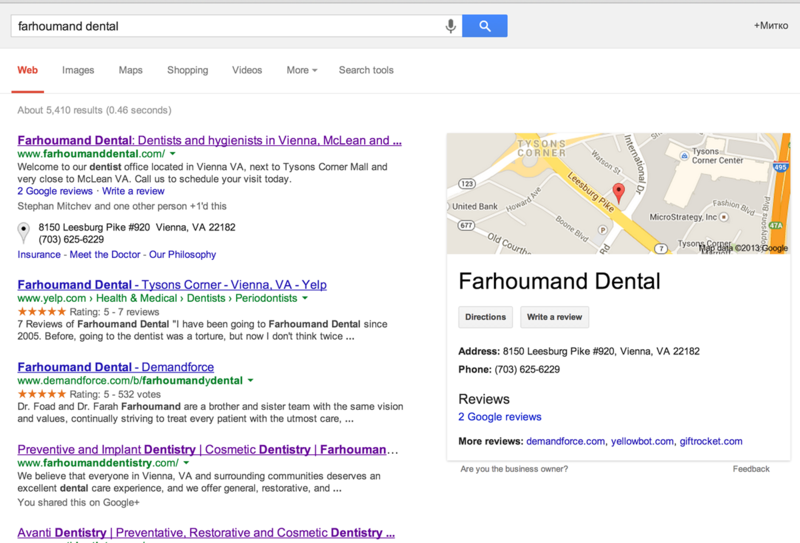 Google generates the information in the right hand box automatically, pulling it from all over the web — in this case the dental practice’s old website and its old Google + page. The problem is that the phone number listed is old, currently incorrect, and is in fact the phone for the newly minted competitor, Avanti Dentistry, which until recently was part of the original Farhoumand Dental Practice. This presents a real business problem because old and new customers are mislead to call the competitor, leading to actual loss of business. Herewith comes the value of search engine optimization! I believe you are dealing with an issue of identity changes. This can be complex, but can be dealt with by integrating SEO strategy to enable the new site being found. The following are some things to consider. There are more, and hopefully other help will come forward with other strategies. 2. Be sure to use the original name in the Title, Description and Content on the page (near the top of content). This will enable you to obtain positioning organically. 3. If you can, blog about the transformation — as search engines love Blogs. If you add the appropriate content which your clients are searching for on a consistent basis, you may be able to move your position to the top in time. 4. Reach out to your prior clients, and ask them to get the message out to others. 5. Connect with Social Media where your clients most likely hang out. 6. You may want to have similar page names to the old site which are optimized as much as possible to bring them to the new site. I wish you the best in your transformations. I will be tracking on this blog the adventure of optimizing the new Farhoumand Dental website for the search engine as well as user experience. Google pulled an ironic prank today by featuring the Yosemite National Park on its Google Doodle the exact day, 123 years after its creation, when the National Park Service is shutting down because of the government’s inability to come to an agreement and keep its basic services running. Having your website featured on Google’s front page with a creative Google Doodle is, of course, the ultimate search engine optimization accomplishment. But a website rarely exists as an abstract entity not related to business, organization or a person. When that business is closed but its website is open to the biggest web traffic imaginable, the user-friendly thing is to update the website and clearly indicate of the closing or the limited working hours. The National Park Service, no doubt hoping for the best, has no indication on its website of the possible closing. YosemitePark.com run by DNC Parks and Resorts at Yosemite, Inc., an authorized concessioner of the National Park Service, has put a simple warning indicating the possibility of the park closing. Thinking holistically about how a website is used improves its usability and solves a number of potential problems particularly when the website represents a physical place of such enormous beauty as Yosemite National Park. I had wonderful time when hiking Yosemite with my cousin’s family 4 years ago and would not want to be among those who have just arrived at the park to only be told they need to leave. Of course, the closings are not the fault of the National Park Service, but whoever operates the websites should have been prepared enough to use the web as communication medium and clearly indicate that, sadly, the 123rd anniversary of Yosemite, will not be celebrated. Because they’ve laid off half the editors! I will be speaking with my colleague Stephan Mitchev on Big Data and its application at a presentation titled “Unity in Diversity: Towards Unified Data Future” at the Big Data & Analytics in Government Summit. As the title suggests, we will focus not on the size aspect of “big data” but on its diversity — the fact that we work at an organization that deals with data of varied systems and formats and yet we need to put it to good use. Starting with the notion that, as Kenneth Cukier eloquently explains, we have arrived at the era of “datafication”, we need to consider what we do with the massive volumes of data we collect. Unless we make use of data, should we collect it? Establishing these basic principles, we can then approach the architectural challenges of processing and analyzing massive volumes of data in order to gain insight from it. What challenges do you face? How do you approach and resolve them? Blogs throughout the world are reporting that there is an on-going and highly-distributed, global attack on WordPress installations across virtually every web host in existence. Before you do that, make sure to create a new administrator account, log out from the original admin account, log into the new account and only then attempt to delete the old admin account. That should be a no-brainer but it is surprising how many sites get hacked because of simple passwords being used. The Geek Stuff offers some ideas for creating strong passwords but if your WordPress is updated, it will tell you if the new password is strong enough. A terrific WordPress plugin, Limit Login Attempts is a good start. Your hosting company should offer this and if not, you should perhaps change your web hosting company. I can highly recommend LunarPages! Use code “aff15off” for 15% off of a new shared hosting account if you sign up today!